Regimes that crave U.S. support in their regional rivalries are apt to strike two different postures that may seem contradictory but really aren’t. They publicly play up the supposed threatening nature and incorrigibility of the rival, to keep Americans thinking that the United States should take sides against the rival. But they also realize that unending hostility and tension are not in their own best interests. They realize that there are two sides to every dispute, that compromise and conciliation are necessary to keep conflict from escalating, and that peace in their neighborhood is better than war. This combination of postures characterizes the Persian Gulf Arabs and especially Saudi Arabia. Ties to the United States have been, ever since Ibn Saud’s meeting with Franklin Roosevelt during World War II, important to the Al Saud despite the absence of a mutual security treaty. The fragility of their anachronistic family rule has made an implied U.S. security guarantee especially useful to them. Since the end of the Cold War, the USSR can no longer function as chief bogeyman (although the Saudis are happy to sound Cold War echoes regarding Russian involvement in Syria). The Sunni extremism that since the Cold War has become a major American preoccupation hits too close to Saudi Arabia being part of the problem rather than part of the solution for it to be the centerpiece of a Saudi strategy for drawing in the Americans. That centerpiece has instead been the purported threat from Saudi Arabia’s cross-Gulf rival Iran. 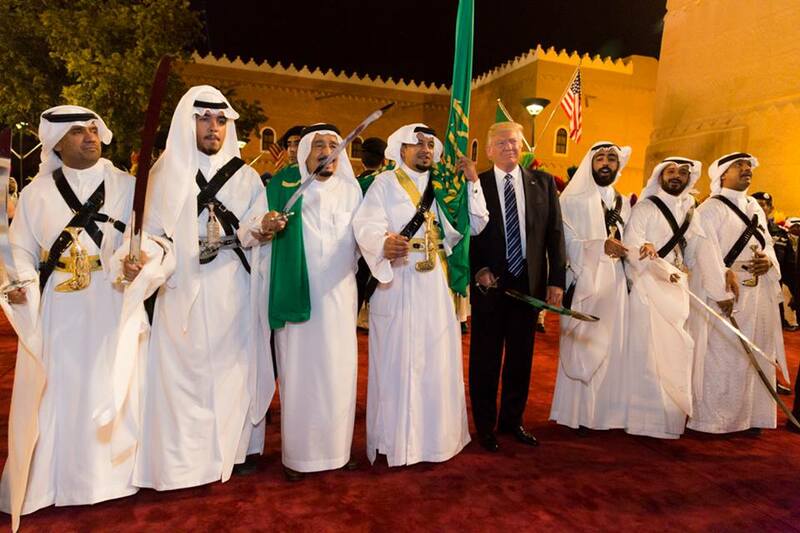 With the Trump administration, this part of the Saudi strategy has been conspicuously successful, as illustrated by Donald Trump’s sword-dancing visit to Riyadh earlier this year. The Saudis could not hope for a more unquestioning U.S. taking of their side in the cross-Gulf rivalry. But a lessening of tension in that rivalry is in Saudi Arabia’s interests, as well as being in the interests of Iran. Both countries rely on the oil trade continuing without interruption from armed conflict or the fear of such conflict. Both have potentially restive domestic minorities that could find sympathy and support on the other side of the Gulf. For the Saudis this mainly means Shia in the Eastern Province. In Iran this means not only Arabs but other ethnic minorities among whom ISIS is trying to stir up trouble in revenge for Iran’s strong opposition to the group elsewhere in the Middle East. 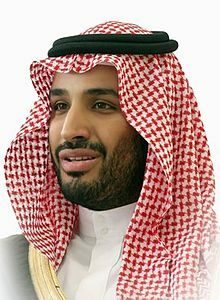 The young and powerful Saudi crown prince, Mohammed bin Salman (MbS), has hitched his rise to a more aggressive Saudi foreign policy that seeks regional hegemony at the expense of, among others, Iran. The setbacks associated with that policy, however, have MbS thinking about course corrections. In particular, he appears to be seeking a way out of the highly costly and unsuccessful military intervention in Yemen. Thus it is no surprise to see multiple reports that MbS is actively seeking improved relations with Iran. He is looking to Iraq to play a helpful mediating role in this endeavor, and Saudi Arabia already has taken several steps to improve its relations with Iraq itself. This diplomacy is proceeding quietly, thus not diminishing for American audiences the established line about Iran being a threat. But the direction of Riyadh’s diplomacy is clear, and it is just as much in Saudi Arabia’s interests as were previous rapprochements between the Kingdom of Saudi Arabia and the Islamic Republic of Iran. All this makes Trump’s vehement and unbending hostility toward Iran all the more likely to further isolate the United States. It is a hostility that has fallen behind the curve of Persian Gulf diplomacy. Trump may have been dancing to the Saudis’ tune insofar as that tune was written to ensure that the United States took Saudi Arabia’s side, but the resulting policy of the Trump administration is not in the interests of Saudi Arabia itself, nor of the other Arab members of the Gulf Cooperation Council. Most important for Americans, it is not in the interests of the United States — which, along with the Gulf Arabs and Iran, shares an interest in a Persian Gulf characterized by peaceful commerce and competition for influence, rather than by confrontation and conflagration. 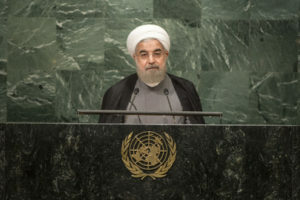 The Joint Comprehensive Plan of Action, otherwise known as the Iran nuclear agreement, figures into this equation because of Trump’s declared intention to destroy the accord despite Iran’s compliance with it. Negotiation of the agreement had made the Saudis nervous about a possible major realignment in which the United States would start taking Iran’s side more than Saudi Arabia’s. The nervousness was one of the factors, along with the rise of MbS, that made opposition to Iran a prominent theme in Saudi statements over the past year or two. The Saudi fear was always unwarranted; even just the restoration of normal diplomatic relations between the United States and Iran was not in the cards during the Obama administration. Obviously the relationship is going nowhere in a positive direction under Trump. An accord that is working to keep closed all possible paths to an Iranian nuclear weapon is in Saudi Arabia’s interests, and the Saudis are smart enough to realize that. The Saudis do not need a nuclear arms race in the Persian Gulf, and if one occurred, the Saudis probably would lose it. For Trump to carry through with his threat to trash the agreement would represent a piece of campaign baggage that is in nobody’s interests.